The public has been invited for two walks along the city’s waterfront to explore the possibilities on how to bring it to life. Hosted by Boston landscape architects Brown, Richardson + Rowe (BRR), the informal tours are designed to see the site and consider ideas on how to activate a key section of the city. This is your chance to tour Lynn's waterfront zone. 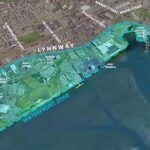 Earlier this month, BRR and the Lynn Economic Development & Industrial Corp., the city’s development bank, had the first public hearing on locating potential new parks, public spaces and a promenade along the waterfront. More hearings will be held next month, but the dates have not been selected. The suggestions from more than 100 residents who filled the City Council chamber included: a drive-in movie theater, soccer fields, playgrounds, a bike path, kayak and roller skate rentals, and locally owned boutique shops. The goal is to complete a waterfront Open Space Master Plan. The first walk is scheduled for Wednesday, May 24 at 5:30 p.m. and will take off from the parking lot behind Walmart at 13 Hanson St., off the Lynnway, next to the Lynnway Mart. The route includes a walk down Riley Way along the waterfront to the former landfill site and views of the harbor. A second walk is slated for Tuesday, May 30 at 5:30 p.m. to explore Ferry Terminal and Lynn Heritage State Park. Walkers are asked to meet at the ferry dock parking lot at the end of Blossom Street for the first part of the walk. Later, they will then drive to Lynn Heritage State Park at 6 p.m.